John Robert Vaizey JP DL, High Sheriff 1877. Or on a cross Azure quarter pierced of the field between four mascles Gules as many crosses crosslet fitchee Argent a canton of the second charged with two swords in saltire points upwards proper pommels and hilts of the first encircled by a double chain gold. Or on a cross Azure quarter pierced of the field between four mascles Gules as many crosses crosslet fitchee Argent. 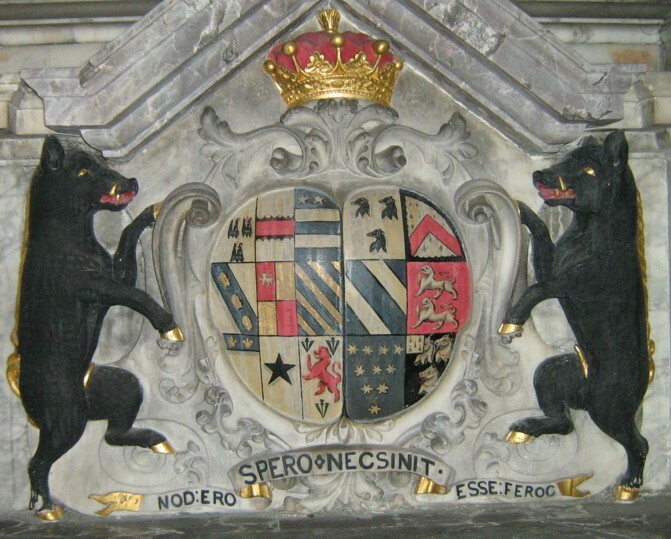 b. William Winchester b.1778 d.
Unfortunately the Arms of Henry Winchester are now being “sold” by at least one online heraldic bucket shop. Vert three mermaids each holding in the dexter hand a mirror proper and in the sinister a comb Or. ** In 1808 one Edward Wollstonecraft was promoted from Ensign to Lieutenant in the Loyal London Volunteers (Militia). John Yarker of Leyburn obtained a grant/confirmation by the College of Arms in respect of his grandfather Luke Yarker in 1758. 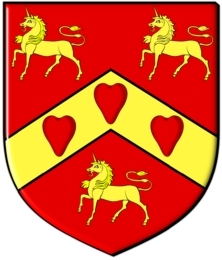 Gules on a chevron between three unicorns passant Or as many human hearts of the field. Quarterly 1st & 4th Gules on a chevron between three unicorns passant Or as many human hearts of the field (for Yarker) 2nd & 3rd Argent a chevron Vert between three bugle horns Sable stringed Or (for Forster). Quarterly 1st & 8th Argent three horse shoes Sable (for South) 2nd Gules on a bend Argent three swans proper (for Clarke) 3rd Argent a cross of lozenges Vert overall a bend chequy ermine and Azure (for Braddyll) 4th Or a lion passant Sable on a chief Sable a trefoil of the field (for Rishton) 5th Azure in chief two stars in point a crescent Or (For Dodding) 6th Or a fesse dancette between three crosses crosslet fitchee Gules (for Sandys) 7th Party per fess Gules and Azure a castle counterchanged (for Rawson). Quarterly 1st & 4th Gules on a chevron between three unicorns passant Or as many human hearts of the field (for Yarker) 2nd & 3rd Azure six lioncels rampant Argent three two and one (for Leybourne). Quarterly 1st & 4th Barry of ten Or and Sable overall a bend Gules (for Barker) 2nd Barry of twelve Argent and Azure overall three lions rampant Gules (for Woodburne) 3rd quarterly Argent and ermines in the first quarter a fleur-de-lis Gules (for Letham) and in a canton quarterly i &iv Sable on a fess engrailed Or between three squirrels sejeant Argent each holding a marigold slipped proper as many roundels barry of six Argent and Azure (for Smith) ii & iii Argent on a bend Azure three bucks’ heads caboshed Or (for Stanley). Note: From the family details below, it appears that the both the lines listed above, with their wives’ escutcheons of pretence, have expired. However, the descendants of Joseph Yarkers siblings can use the Leybourne quarterings. 4. Charles Braddyll Yarker b.1838 m.1891 (Arabella Robinson) d.1903 dsp? 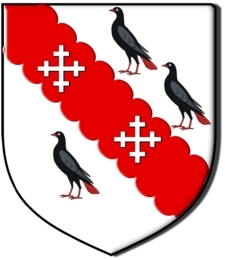 Argent on a bend invected Gules between three Cornish choughs proper two cross crosslets of the first. iv. Zoe Gwynedd b.1912 m.1939 (Lt.Col Brian Morton Forster Franks) d.1977 had issue. v. Sonia b.1917 m1.1939 (Patrick William Butler Pole-Carew dis.1950) m2.1958 (Maj William Henry Cropley Luddington) had issue. f. Maude Marian Quilter b.1868 m.1888 (Frederick Anthony Denny) had issue. g. Norah Blanche Quilter b.1871 m1.1898 (Capt William G Pitt Miller) m2.1913 Capt Guy Noel Vivian) had issue.